• Melania Has Remained Silent About Cheatergate...or Has She? Senate Democrats filibustered the budget in hopes that the Republicans would give in to their demand to shield 700,000 dreamers from deportation. The Republicans didn't budge, the polls didn't look so good, so the Democrats caved. All they got in the end was a promise from Majority Leader Mitch McConnell (R-KY) that he would bring some kind of bill concerning the dreamers up for a vote before the government runs out of money on Feb. 8. He will probably bring up a bill, but it may not be a bill the Democrats like, and even if it is one they like, it may not pass the Senate or the House. And even if it does, Donald Trump may veto it. McConnell's track record on keeping promises is spotty. During the debate on the tax bill, he promised Sen. Susan Collins (R-ME) that he would pass legislation to shore up the ACA. He didn't. He also promised Sen. Jeff Flake (R-AZ) that he would bring up a dreamer bill in January, and so far, he hasn't done that either. However, this promise is much more visible, so it is likely he will bring up some kind of bill. But again, even if it passes the Senate, it could die in the House. What may have convinced Minority Leader Chuck Schumer (D-NY) to throw in the towel is that while polls show the majority of Americans want to protect the dreamers, a majority also does not want to shut the government down in order to get them that protection. The issue isn't dead, of course, but when it comes up again, the Republicans may add a few items to it that are on their agenda, including appropriating $20 billion or so for the wall on the Mexican border, something Democrats oppose. If the Democrats refuse to bite, the dreamers get deported, which will anger their base. If they approve it, the wall might get built, which will anger their base. No matter how you spin it, the Republicans won this particular battle. The Democrats did get a consolation prize though. The Republicans included 6 years of funding for the Children's Health Insurance Program as a sweetener. Republicans don't really object to that program because polls show it has wide bipartisan support, so it wasn't a concession in any way. However, the bill slashes funding for community clinics that care for low-income patients, so having insurance doesn't help children much if there is no clinic available where the insurance can be used. Many Democratic activists were furious that the Democrats caved without getting anything other than a vague promise from McConnell in return. The co-executive director of Indivisible, Leah Greenberg, noted that millions of people had demonstrated against Trump during the weekend and tweeted: "Your constituents want you to fight. How can you possibly not understand that?" Monday's developments marked a reverse for the blue team in other ways; Donald Trump is claiming victory (however tenuous that claim may be), and it has become clear the Democrats are not as united as some partisans had hoped, with a significant divide between the red-state Democrats running for re-election in 2018 and the rest of the caucus. On the other hand, maybe we are getting ahead of ourselves here. Some Democratic activists are not so sure that the Party did all that badly on Monday. To start, if nothing happens with DACA in the next three weeks, the Democrats will be in a stronger position if they decide to dig in again. "We made a deal, we did our part, and the Republicans did not do theirs" will be the refrain. Further, the CHIP funding is nothing to sneeze at, and the GOP didn't actually get all that many concessions beyond an agreement to reopen the government. It is also the case that the dealmaker in chief has been revealed to have no clothes, and that the next time around, he's likely to be circumvented. Finally, if DACA does not get saved—and again, this is a program that most Americans support—it will not be Democrats who take the blame. "We did what we could," they will say, and then when election time comes, they will observe that the dreamers will only have a future in America if the blue team controls Congress. That just might get a few people to the polls in states like Nevada and Arizona, which are key to the Democrats' hopes of retaking the Senate. Clearly, the dog house at 1600 Pennsylvania has a conveyor belt or a Lazy Susan in it. One day, a Ryan Zinke or a Wilbur Ross is the bee's knees, and the next day they are in danger of being canned. One day, a Jeff Sessions or a Rex Tillerson is all-but-fired, and the next they are right back in Trump's inner circle. It must be tough to keep track for those who work in the White House. The latest person to (apparently) ride the conveyor belt is Chief of Staff John Kelly. The relationship between the former four-star marine general and the President has always been difficult, and now, according to reporting from Vanity Fair, it's near the breaking point. Kelly is roundly disliked by the White House staff, who call him the "Church Lady" (a reference to an SNL sketch of yesteryear featuring a fastidious, overly-judgmental, frigid old woman). The general has also aggravated the President by disagreeing publicly with him about the Mexican wall, and by assuming more authority than is his due. "I've got another nut job here who thinks he's running things," Trump reportedly told one friend, while another says Trump told him that "This guy thinks he's running the show." Kelly, for his part, is supposedly tired of the President's offensive comments and loose managerial style, is particularly bothered by The Donald's approach to North Korea, and has threatened to quit several times. In a 5-2 decision, Pennsylvania's supreme court threw out the state's map of congressional districts, calling it a partisan gerrymander that violates the state constitution. The Republicans control 13 of the state's House seats to the Democrats' 5, even though Democrats have gotten roughly 50% or more of the statewide vote in recent House elections. 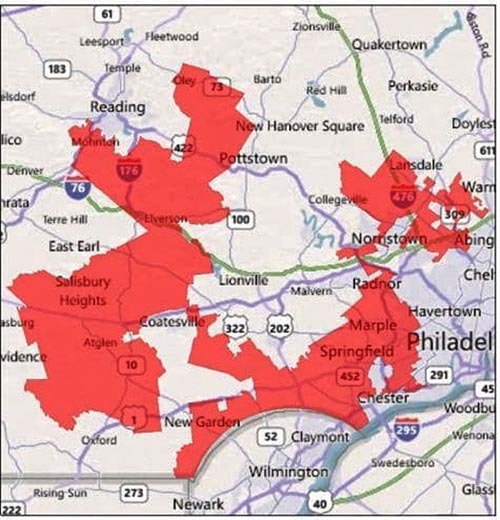 Probably the most mocked district in history is PA-07, shown below in red. The district's nickname is "Goofy kicking Donald Duck." The current representative is Pat Meehan (R-PA). The emphasis here is on "current," because Meehan recently got caught using thousands of dollars of taxpayer money as hush money to silence a former aide who accused him of sexual misconduct. So, he may soon be the "former" representative for PA-07. Donald Trump has boxed himself into a corner. Quite a few corners, actually, though this particular one involves the North American Free Trade Agreement (NAFTA). Trump campaigned hard against the agreement, which he lambasted as unfair to American interests. That means that he is compelled to demand concessions that the Canadians and Mexicans aren't willing to swallow. For example, NAFTA currently requires that 62% of the parts in a car sold in North America must come from the region (without specifying any particular nation). Trump wants to up that to 85%, and also to declare that half of the 85% must come from the United States. That, of course, would leave Canada and Mexico with quarter shares and more expensive cars, both of which they will not accept. Similarly, Trump wants to insert a "sunset" clause in the agreement that would allow any of the three countries a chance to terminate it every five years. Again, Canada and Mexico are unwilling, as they cannot do long-term economic planning around a pact that could change or disappear in five years. At the moment, trade representatives from the three countries are engaged in their sixth round of negotiations and no progress is being made. If they don't figure something out—and, given Trump's conditions, they are not likely to do so—then soon the Mexican presidential election season will be underway (March) followed by the U.S. midterm election season. Both will effectively forestall a deal for the rest of 2018. A copy of Donald Trump's infrastructure plan has leaked out. About half the money goes to encouraging states and localities to find their own money for infrastructure improvements, generally by paying for 20% of the cost. Under these conditions, states are likely to apply only for projects they were planning to finance themselves anyway and treat the 20% as found money. Another quarter of the appropriation will go to rural transportation, broadband, and other projects. Ten percent will go to unique projects that can't be funded in normal ways. Using the 20% figure as the basis, the "trillion-dollar" infrastructure project will probably require only $200 billion from Congress, and possibly less since the 20% federal contribution applies only to half the funding. Axios has published a complete copy of the plan. Melania Has Remained Silent About Cheatergate...or Has She? Melania has backed out of her husband's trip to Switzerland, citing "logistical issues." The Gallup organization has put together a list of how popular presidents since Dwight Eisenhower have been in their first years, the so-called "honeymoon period." Here are the data. CNN/SSRS has a new poll exploring all manner of questions, including the approval rating of the current president and his two predecessors. While Donald Trump is holding steady at a 40% approval rating, Barack Obama is up to 66% and, in a bit of a surprise, the once-unpopular George W. Bush has jumped up to 61%. Most of that rise has been fueled by independents and Democrats whose opinion of #43 has softened over time. After leaving the White House, personality starts to loom much larger, and most presidents not named Nixon are basically pretty likable fellows. This is how, in a 2000 Gallup poll of voters, Jimmy Carter managed to be ranked the fifth-best president of all time, behind only Reagan, Clinton, JFK, and Lincoln, and ahead of Washington and the Roosevelts. Jan22 Will There Be a Blue Wave in November? Jan21 Who Will Be Blamed for the Shutdown? Jan21 Why Isn't the Stormy Daniels Story Bigger? Jan19 What Is Bannon Worth to Mueller? Jan17 Which 2020 Candidate Does Trump Fear Most?